In two studies last spring, Pew Research Center examined patterns in Google searches, first to track public interest in the Flint, Michigan, water crisis and later to learn more about refugee migration patterns in Europe. A new analysis uses a similar methodology to look at Americans’ interest in guns. We analyzed long-term trends in U.S. Google keyword searches for 416 specific gun model names, compiled from two sources: GunBroker.com, an online gun auction website, and the American Firearms Institute, a gun rights advocacy website that provides information about firearms. While not exhaustive, the list includes many popular handguns and rifles. By focusing on the models of guns Americans are searching for, we sought to learn more about the public’s interest in guns as potential consumer products, rather than as a subject of general interest. This analysis builds on a 2017 Pew Research Center survey that found that about four-in-ten Americans live in a gun-owning household. Here are four key findings from the analysis. 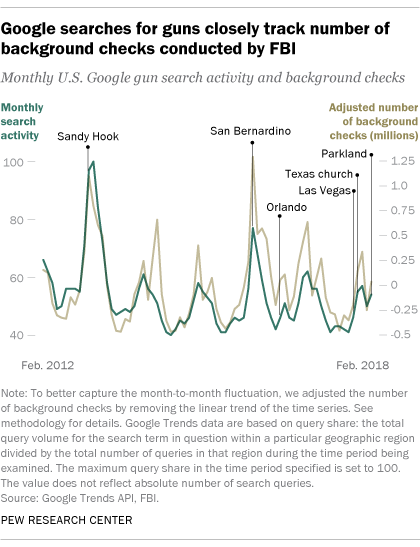 1 Google search activity for specific gun models tends to rise and fall in a similar pattern to the number of background checks conducted by the FBI. 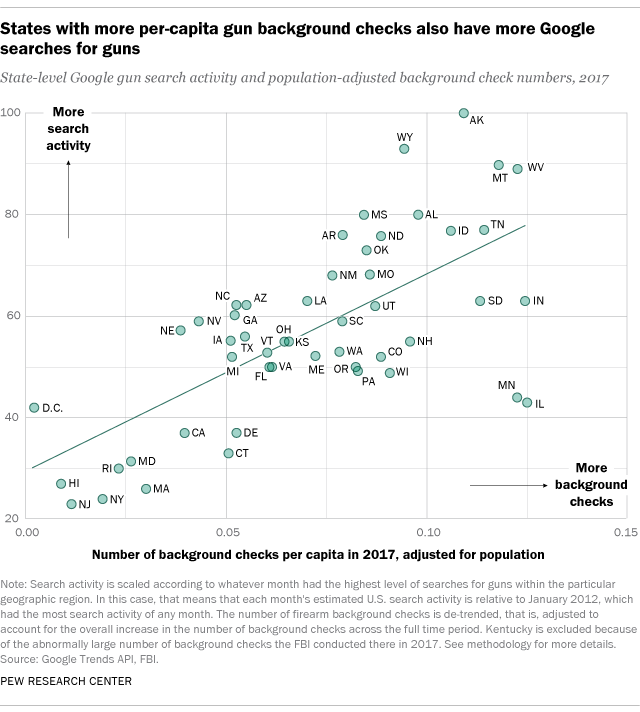 When we examined monthly, nationwide Google searches for the gun models on our list between February 2012 and February 2018, as well as the adjusted number of gun background checks the FBI carried out each month during this period, we found a strong correlation between the two. This finding aligns with other research that has found that Google search activity tends to track real-world economic indicators closely. A 2017 paper published in the journal Science also found that the search term “buy gun” is strongly correlated with background checks. 3 National search interest for gun models tends to increase during the holiday shopping season. 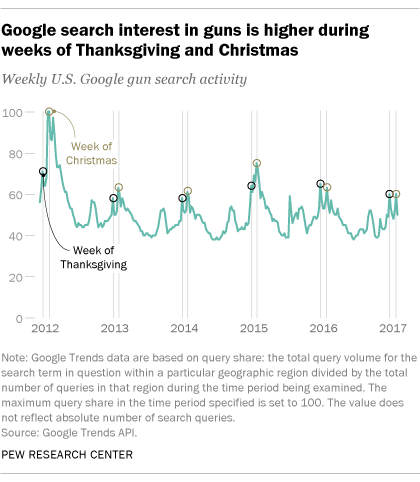 In each year from 2012 through 2017, weekly Google search activity for gun models rose an average of 20% during the week of Thanksgiving and 14% during the week of Christmas, relative to one week prior. (Weekly search data are only available after 2012.) The FBI’s background check data show a similar trend: Black Friday, for example, has set a single-day record for gun background checks in each of the past three years. However, there was no similar increase in monthly search activity for gun models in October 2017, when the Las Vegas shooting happened, or this past February, the month of the Parkland, Florida, high school shooting. In fact, average search activity in those two months was lower than the average of the same month the previous year. Again, this overall pattern is reflected in FBI background check data: The number of background checks soared in the months of the Newtown and San Bernardino attacks, but not in the months of the Las Vegas or Parkland shootings. When considering Google search data as a research tool, it’s important to keep several caveats in mind. For one thing, 11% of Americans don’t use the internet, which means their interest in guns can’t be measured through an analysis of online searches. And while Google is the most popular online search engine, not all online Americans use it, so studying Google data won’t capture all internet users. Even internet users who do use Google and are interested in guns may prefer to get information about firearms from other sources, such as print publications or TV. Most importantly, as we noted above, searching for something on Google does not indicate that any particular follow-up action is taken. Despite these limitations, Google search data can be effectively combined with FBI gun background check data to add a new dimension to other research, such as the Center’s broad survey of gun owners and non-gun owners last year. Note: For more about the analysis, read our methodology (PDF).